Heavy duty extruded aluminium roller rocker arm set. Features an oversized body and fulcrum with triangulated profile for additional rigidity and strength. Accommodates most over-sized valve springs. Aluminium roller rocker arm set features full needle bearing on fulcrum and roller tip for increased horsepower and reduced friction. Will also reduce wear on valve tip. 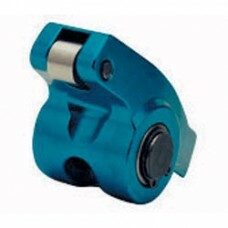 Set contains 16 extruded aluminium roller rockers and locks. Designed for Small Block Chevrolet with 7/16” stud, 1.6:1 ratio. Requires tall valve covers for clearance.